Actress Minnie Driver showed up at the 2012 Vanity Fair Oscar Party wearing a gorgeous custom designed 14kt yellow gold ring featuring a “baroque” Ikecho pearl by Jorge Adeler of Adeler Jewelers. The party was hosted by Graydon Carter at Sunset Tower on February 26. 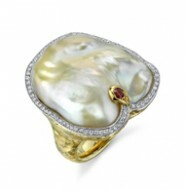 One custom designed 14kt yellow gold ring featuring a gorgeous “baroque” Ikecho Pearl bezel mounted in with a Diamond frame and a Ruby gemstone accent. This is an Jorge Adeler custom designed one-of-a-kind piece.